There are so many stories I could tell about my vision or lack of it, especially in traffic. I never really thought of the verse about “seeing God” in the terms of seeing Him in others–especially others who annoy. Every day we have an opportunity to do just that and every day our hearts have a chance to become purer and purer through our interaction with others. Exam your heart “eyes” today. Is your vision clouded by a selfish, impure heart–judging everyone and every situation through your own attitude and lack of understanding–or can you see clearly through the eyes and heart of God with understanding and compassion? Do you see God when you look at others? He loves each of us the same and he loves that person who may be annoying you just as much as He loves you (who may be annoying that other person as well.). Who knows, maybe someone is having to filter what you are doing or saying right now through God’s heart and eyes. We are all on the same journey–learning to be pure in heart. 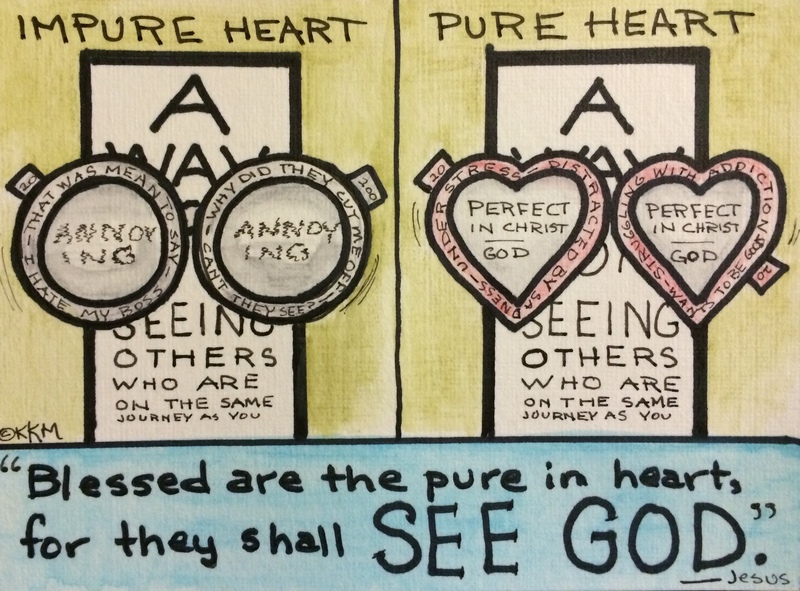 See through God’s eye’s, BE PURE!